Magnus, Robot Fighter is a fictional comic book superhero created by writer/artist Russ Manning in 1963. 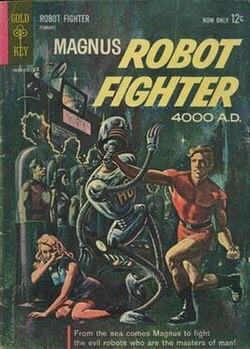 Magnus first appeared in Magnus Robot Fighter 4000 A.D. #1, published by Gold Key Comics in February 1963. The character was subsequently published by Valiant Comics and Acclaim Comics in the 1990s, and was reintroduced by Dark Horse Comics in August 2010. In every incarnation, Magnus is a human who battles rogue robots in the year 4000, though some aspects of the concept have varied with each publisher. Superhuman strength, superhuman durability, extensive martial arts training. By the year 4000, humanity has become dependent on robots. H8, the Pol-Rob [Robot Police] chief of the civic sector of North Am, a continent-spanning mega-city, is damaged in a radiation accident. It seeks to promote the human dependency on robots and gradually impose totalitarian rule in the area under its control. Magnus was raised by a robot known as 1A, a name which implies that he is the very first robot of his type ever manufactured. 1A seems to be self-aware and possess emotions. A firm believer in the Three Laws of Robotics, 1A recognized the threat represented by the dependency of humans on robots in general, and the developments in North Am due to H8 in particular. Therefore, 1A trained Magnus to protect humans against both rogue robots, and humans who used normal robots for evil purposes. Magnus was trained from infancy by 1A in an under-sea domed house, using advanced techniques, to become a skilled martial artist who could break steel with his bare hands. In addition, 1A equipped his charge with a device that would allow him to "hear" robot-to-robot radio communications. Leeja is Magnus's girlfriend. Robots that served as police are called "Pol-Robs" (as in police robots) and are painted black and white like city police cars. All robots have identifying numbers painted on their chest and backs. Other robots, such as taxi drivers, could be nothing more than a torso with arms and head attached to a flying automobile. Both the Gold Key and Valiant versions take place in North Am, a megalopolis that encompasses the entire North American continent. The city consists of several "levels." The higher levels are populated by wealthier individuals, often regarded as "soft" and complacent. The lowest level, the Goph Level, is populated by a hardier and less educated class known as "gophs." Aside from North Am, Earth also features another continent-wide city in Europe and a city on the continent of Antarctica named Antarcto. The city consists of several transparent domes, inside each of which the climate is carefully controlled. Construction of these habitats was fiercely opposed, for fear of ecological damage to the fragile Antarctic system. As well, there is the area known as Himalhina, which apparently includes at least all of India and China. By AD 4000, the nation of Japan is home to 50 billion people. The major islands of Japan are covered by a single, contiguous structure known as the Host. Grandmother, a Freewill electronic network, controls virtually every facet of daily life. 1A, the Freewill robot mentor of Magnus and lover of Grandmother (whom he calls "Kimi"). Talpa ("Mole" in Latin), a renegade robot who seeks to enslave the human race. The original series, titled Magnus, Robot Fighter, 4000 AD, premiered in 1963. It was written and drawn by Russ Manning, and as a nod to its influences, included Isaac Asimov's Three Laws of Robotics as a quote in the beginning of the first issue. For the duration of the title's original run, Magnus battled rogue robots, aliens, space pirates and other threats. He fell in love with Leeja Clane, the daughter of one of North Am's senators. Leeja developed limited telepathic abilities after training by M'Ree and other humans who had acquired them as a result of their minds being linked together while imprisoned in suspended animation by H8. The series was popular in the 1960s. As the '70s approached, sales began to decline. The last issue (#46) was published in January 1977. However, Manning only completed 21 issues; the rest were reprints of previous issues or new stories by others (#23–28). The original concept is a deliberate inversion or update of the Tarzan mythos, the syndicated comic strip which Russ Manning had previously illustrated. Where Tarzan was a human raised as a noble savage feral child by African great apes who saw the world through his naturalistic upbringing and opposition to the rules and limits of civilization, Magnus was a human raised by a benevolent robot named 1A, who saw mankind becoming an ever more decadent and complacent human civilization doomed by its ever-increasing dependence on robots. In one case, the hero is a throwback to a hardier and more naturalistic time. In the other, he is a creation of science sent to carry the message to the rest of humanity that Man must control his own destiny and carve out his own path, rather than become little more than an overfed herd of cattle tended by robots. In both incarnations of Magnus, Robot Fighter, he lives and operates according to his own set of rules and because of this, is considered an outsider and something of a threat to the established order of things. During the first 28 issues, another series called The Aliens ran in the back of the comic. This series ended on a cliffhanger in Issue 28. In the early '80s, a new Magnus backup series ran in the new Doctor Solar title in issues #29–31. This was supposed to lead to a new Magnus title, but Gold Key stopped publication soon afterwards. Supposedly, there was work completed for two new Magnus issues (what would have been Magnus #47, 48), but these have never been published. In 1991, Jim Shooter obtained rights to three Gold Key characters: Doctor Solar, Man of the Atom; Turok, Son of Stone; and Magnus, Robot Fighter. He intended to use those characters to launch his new comic book line, Valiant Comics. Several months later, the company launched Magnus, Robot Fighter. The series began where the original one left off. The artists took great care to replicate the setting and trappings of the original stories. But as the new series progressed, it began to deviate from the original concept. The term "Freewills" appeared in the Valiant run, introducing the concept that the rogue robots seen previously were not simply the product of random malfunctions, but were the result of a common phenomenon which allowed robots to become sentient. While some of them are malevolent, others merely want to be free. It was also learned that 1A is a freewill. With Magnus's help, a colony of benevolent Freewills is established called the "Steel Nation." At the same time, Magnus becomes disgusted with North Am's elite. He journeys to the lower levels of North Am and befriends a group of social outcasts known as Gophs. In 1992 Valiant published the popular crossover Predator Versus Robot Fighter. Valiant president Steven Massarsky recounted, "We started this project in February , knowing that this time of the year [John] Ostrander would be taking things over [in] Magnus, so we want to generate renewed interest in Magnus." As the series progressed, it was used to introduce other heroes to the Valiant Universe. In issue #5, a Japanese hero known as Rai began appearing in Magnus's title, and would eventually move on into his own series. In the sixth issue, the future version of Solar made his debut. The issue also introduced the spider aliens, who became a recurring threat throughout the Valiant Universe. In the 12th issue, modern readers were reintroduced to Turok, Son of Stone. During the Unity crossover, it was revealed that Magnus was actually born during the Unity conflict. He was a child of a harbinger named Torque and a woman named Kris Hathaway. Geomancer Geoff McHenry sensed that someone like Magnus was needed in the future, so Solar transported the baby Magnus to the future, where he was picked up by the Solar from that time period and delivered to 1A. It was also revealed that Magnus's strength wasn't solely due to his martial arts training; rather, it was a harbinger ability inherited from his father. Shortly after the Unity crossover, the future Earth was invaded by alien robots called Malevs directed by the giant brain, introduced in the original series, that encompassed the planet of Malev 6. This invasion forced all of the future heroes to band together. Their adventures were showcased in a spin-off title, Rai and the Future Force. After the Malev War ended, all future titles jumped twenty years forward. Magnus became the leader of North Am. He married Leeja (his love interest since the original series) and had a son, whom he named Torque. Magnus spent the rest of the series battling various threats. During the Chaos Effect crossover, he was transported to the 20th century, but he eventually returned to the future. Deathmate was a joint publication by Valiant Comics and Image Comics. In this continuity, Magnus was given the name "Chris Torkelson" and was a child raised and trained by Battlestone, who was working for the Harbinger Foundation. In this series, Magnus's parents were both killed by Battlestone while trying to escape the Harbinger Foundation. Years later, Magnus would confront Battlestone about this, and fight him to more or less a standstill, while Geoff McHenry, the Geomancer of Earth, would lament that reality was literally coming to an end around them. The world ends as Magnus and Battlestone fight to the death. In 1995, Voyager Communications, the company that owned Valiant Comics, was bought by Acclaim Entertainment. At first, it continued publishing Valiant Comics titles, but sales began to plummet after the direct market crash and the comics division was shut down. Magnus, Robot Fighter was one of the last titles to be canceled. In 1997, Acclaim Entertainment relaunched its comic book division. All Valiant Comics characters were altered and rebooted, including Magnus. This time, Magnus was re-imagined as an insane robot fighter who, in addition to the original's strength and skills, had metallic blood that repaired his injuries. The series was much more comedic and self-parodying than any of the previous incarnations. Two years later, Acclaim Comics closed, and Magnus's title was one of the first to go, along with most of the line. In 1999, Acclaim Entertainment made a final attempt to revive its comic book line, and Jim Shooter was invited to write a "Unity 2000" crossover. Due to financial troubles within the company, only three issues of six were published. The Valiant version of Magnus played an important role in the crossover, while the Acclaim version was a background player. In 2002, the rights to Magnus, Robot Fighter reverted to Random House, which, at that point, acquired Western Publishing's assets. It made a contract with Dark Horse Comics to reprint the original series. In 2006, ibooks Inc published a graphic novel (of novelette length) reintroducing the characters, with new extraterrestrial robotic foes. It is not currently known whether they will continue with further issues, in light of their recent bankruptcy. In 2010, a comic that included Doctor Solar and Magnus was published for Free Comic Book Day. The character Leeja was ranked 56th in Comics Buyer's Guide's "100 Sexiest Women in Comics" list. In 2009, at the San Diego Comic-con, it was announced that Dark Horse Comics would begin publishing a new Magnus, Robot Fighter series written by Jim Shooter. The first issue of the revised series was published in August 2010, with artist Bill Reinhold. Four issues were published, all collected in a trade paperback collection in 2011. As of the end of 2013, Dynamite had acquired the rights to Magnus along with three other Gold Key characters: Turok, Solar and Dr. Spektor. On 6 March 2014, they published an online preview of the first issue. The first issue was written by Fred Van Lente, with art by Cory Smith and cover by Gabriel Hardman. The series ran for twelve issues from March 2014 to March 2015. In this version of the setting, Russel Magnus works in a bucolic alpine town as a middle school history teacher who also coaches the school's martial arts team; as of the first issue he is trying to raise funds to get the team to a tournament in United Korea. He is married to Moira Magnus, a mechanic who works on industrial robots, and they are expecting their first child. Humanoid robots attend Magnus' school as students, as well as being integrated into a variety of purpose-built chassis. The inhabitants of the town interact with an omnipresent avatar of 1A that appears on ubiquitous display panels. In June 2017, Dynamite launched yet another rebooted version of the character, this time a female psychologist named Kerri Magnus who is tasked with reintegrating rebellious robots, or 'AIs," into society. Her adventures were published in a limited series of five issues from June to October 2017. ^ "Magnus Robot Fighter index". Darkmark6.tripod.com. Retrieved 2014-02-23. ^ "Predator vs. Magnus Robot Fighter TPB :: Profile :: Dark Horse Comics". Darkhorse.com. 1994-10-01. Retrieved 2014-02-23. ^ Frankenhoff, Brent (2011). Comics Buyer's Guide Presents: 100 Sexiest Women in Comics. Krause Publications. p. 39. ISBN 1-4402-2988-0. ^ "Magnus, Robot Fighter #1 (Bill Reinhold cover) :: Profile :: Dark Horse Comics". Darkhorse.com. 2010-08-04. Retrieved 2014-02-23. Magnus, Robot Fighter: Steel Nation (Voyager Communications, 1994). Magnus, Robot Fighter: Invasion (Voyager Communications, 1994). Unity Saga (Voyager Communications, 1994). Magnus, Robot Fighter, 4000 AD at Don Markstein's Toonopedia. at Don Markstein's Toonopedia. Archived from the original on February 12, 2016.